Season your salmon steaks with salt and pepper on both sides and if you wish, brush it with a little bit of oil. I used some low calorie cooking spray which I sprayed directly on the baking paper (saves you scrubbing the roasting tin afterwards). Sprinkle with some fresh parsley – I like the curly leaf one, its prettier – and bake in the oven for about 20 minutes, depending on the thickness of your steaks. Keep in mind that wild salmon cooks even quicker than farmed one so start checking after 10 minutes if using wild. Garnish with a fresh cut lemon wedge and more fresh parsley. Et voilà! I think this is a much more interesting way to enjoy green beans than steamed or boiled (SO boring!). Finely chop the onion, trim your beans and cut them in halves, slice the mushrooms. First, fry the onions until they start to turn golden – I like using coconut oil when I want to keep it light. 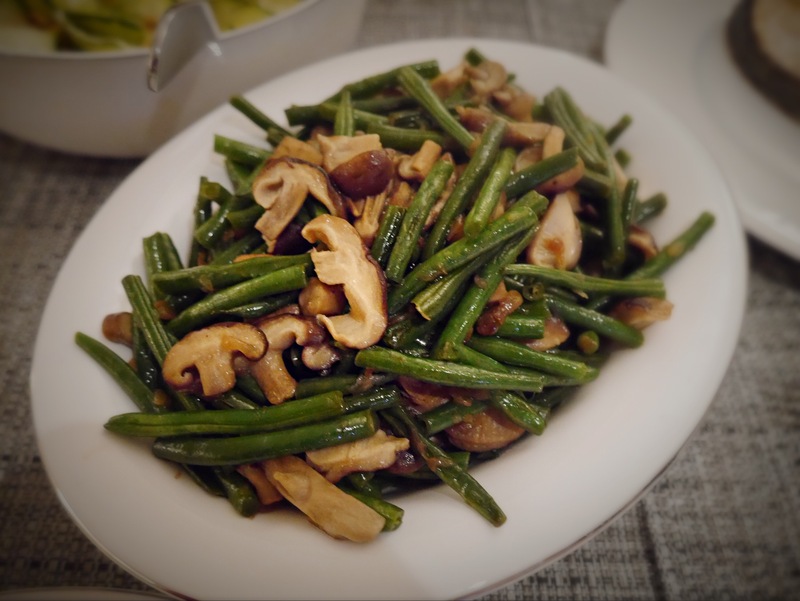 Then add the beans and stir-fry for a few more minutes before adding the mushrooms and frying everything together, stirring frequently, until tender. I like my beans crunchy, so I turn off the heat when they are still quite al-dente. Season to taste. Toast the pine nuts for a few minutes in a small non-stick pan without oil, stirring frequently. Don’t walk away as they burn very quickly! Using a vegetable slicer shave off the courgettes into nice, long, millimeter thin strips (see photo above). 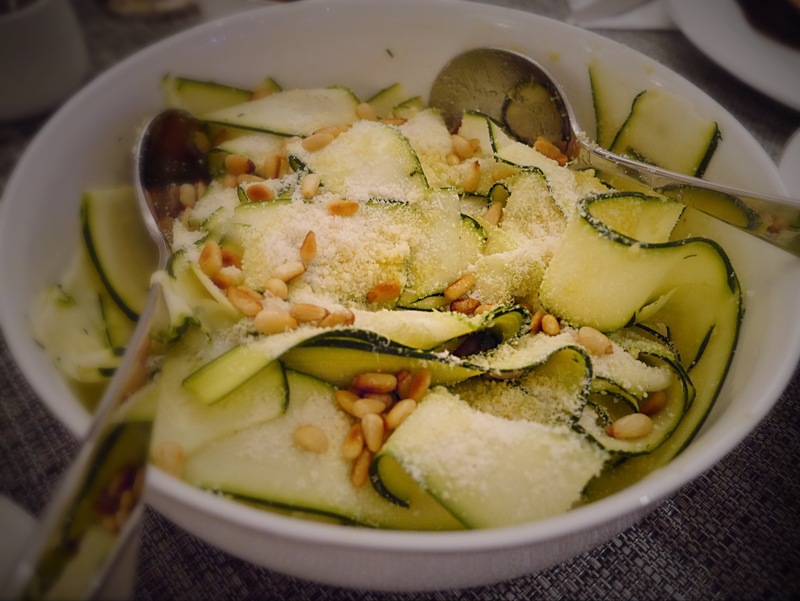 Add toasted pine nuts, grated parmigiano, mix through lightly and dress with good extra virgin olive oil. Season to taste and serve immediately. 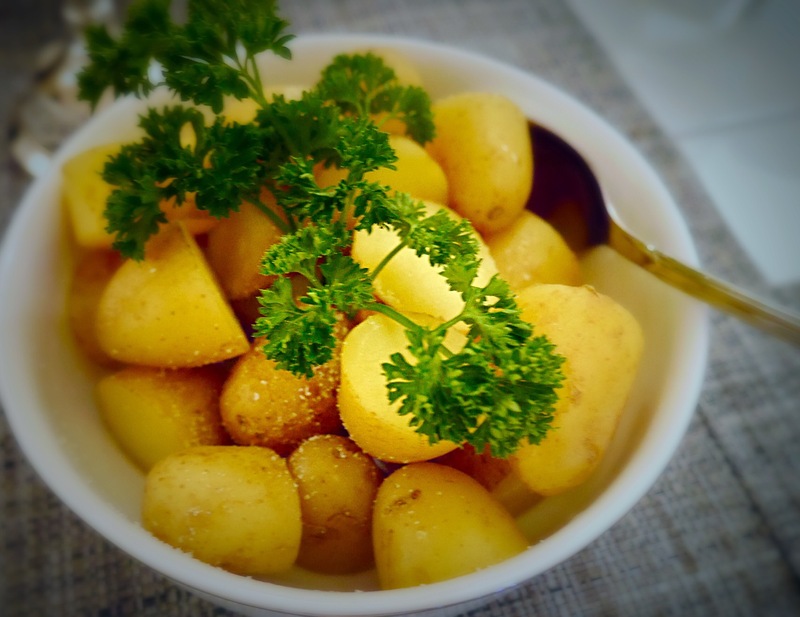 Not much to say here: boil baby potatoes, add some butter shavings if desired, grind some rock sea salt over the top, garnish with something pretty. Done. In fact, I also stir-fried some samphire to garnish the salmon (click on the word if you don’t know what it is), but completely forgot about it and only re-discovered it in its pan long after dinner, looking very sad (therefore no photos). 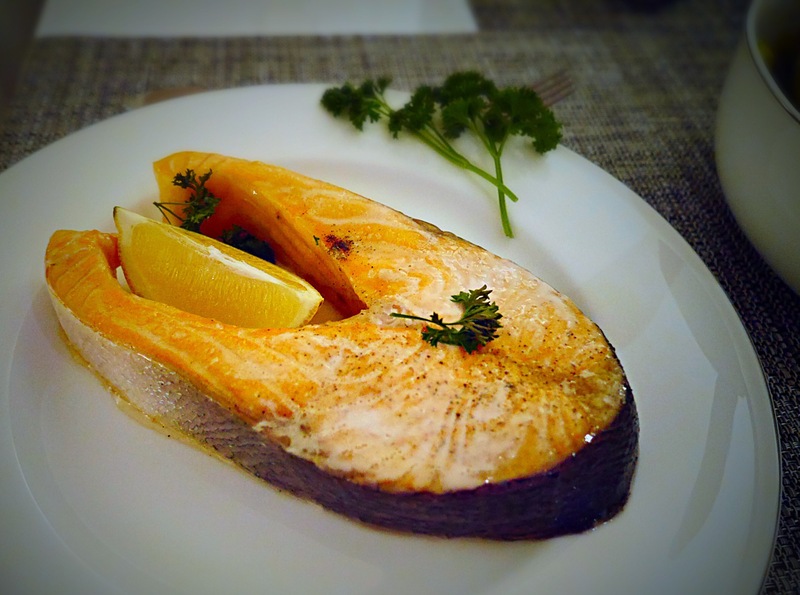 WINE PAIRING: a classic recommendation would be a creamy Chardonnay to match the weight of the oily fish. Alternatively a light bodied red would also do the job, e.g. Pinot Noir or Gamay. Because I am not a big lover of Chardonnay, I offered my guests a choice between Triade Bianco, a blend of Italian varieties Falanghina, Fiano and Greco for white; and a Bouchard Père et Fils Beaujolais from Fleurie, Burgundy, for red. Both wines complemented the meal very nicely without overpowering its rather delicate flavors.